Aron Ralston was recovering in the hospital when the calls and emails began to flood in from around the world. Reporters, well-wishers, agents, publishers, and interested ghost-writers all began to contact the overnight sensation. He was that guy who had cut off his own hand to save himself from a lonely death in a narrow canyon. The popularity of Aron’s unbelievable survival story was immediate and intense. “This” was the epic story that emerged from that barren desert in Utah the minute the helicopter rose out of Blue John Canyon in April of 2003. “This” was a story for the ages. The then 27-year-old hiker escaped from a six-day entrapment by making the excruciating decision to break both bones in his forearm so he could amputate his hand at the wrist. He then hiked out of the canyon dehydrated, exhausted, hungry, and bleeding until he found hikers who helped get him to rescuers. Aron’s decision to amputate saved his life, and he was left with a choice about what to do with the second chance he had been given. One of the decisions he made was to write his own book. He knew there would be media coverage, but he recognized it would all eventually fade away. “People wrote to me and told me about how my story had helped them,” he says. One woman shared with Aron she was so inspired by his fervor for life she had flushed the sleeping pills she had planned to use to take her own life. After hearing the impact of his story, Aron knew it needed to be immortalized in a book. He is not the type to turn down a challenge, and the idea of being able to leave a legacy on his own terms, and in his own voice, appealed to him. A mechanical engineer turned adventure outdoorsman, Aron’s only writing experience was his college papers. He preferred to spend his time living great stories as opposed to writing them. He did, however, have a deep appreciation for the type of adventure/survival writing he was going to have to do. He wanted the inspiration of his story to continue. “Writing the book became about the legacy I could leave,” he says. Impressed and inspired by the spirit of outdoor adventurers, Aron has always enjoyed reading about the extreme experiences of others. Before his accident, he remembers reading two impactful books that became necessary sources of inspiration for his own journey. While Aron was pinned against the canyon wall, he had time to consider the possibilities of what life would be without his hand. He hadn’t yet decided to go through with the amputation, but he was certain his hand would not be salvageable. He remembered an inspirational adventurer, Warren MacDonald, whose book, A Test of Will, recounts similar entrapment by a boulder that resulted in the double amputation of both of his legs. Another adventure writer whose book helped Aron as he prepared to get his story down on paper was Joe Simpson. Simpson’s Touching the Void is an award-winning book turned motion picture that tells of the harrowing efforts of a broken man who had to make a one-way decision to save himself from death on the side of a mountain in the Andes. Aron reread Simpson’s book as he prepared to write. The way Aron lives his life is the way he embraced the challenge of writing. He started the outline three months after the amputation, and three months after that he was sitting with a blank page preparing to start chapter one. Writing became part of Aron’s journey. “I wanted it to be compelling and I wanted it to be well done,” he says, “I looked at it as this immense puzzle trying to put pieces together in the right order, and I had so much fun with even the technical process of writing.” He spent hours studying the words and contemplating how they might fit together the way he pictured. He circled words he read in other places, and brought them back to his manuscript. The process of retelling and the intricate demands of the technical aspects of writing became a part of the adventure for him. As every adventurer knows, however, nothing worthwhile comes without struggle. For starters…Aron had to learn to type with one hand. He had attempted to use transcription software but was not satisfied with the emerging technology of 2003. Frustrated by his efforts, he scrapped the idea of transcription and simply taught himself to type left-handed. He was predominantly right-handed before the accident, so he was already teaching himself to do life left-handed anyway. He acknowledges his gratitude for a level of dexterity in his left hand because of the years he spent playing the piano. However, even with the increasing speed of his typing, he was regularly slower with his hand than the thoughts were moving in his head. And there were all those holes in the story that needed to be filled. Aron knew the solitary version of what happened for his 127 hours of entrapment, but he knew that was not the entire story. In the same way he researched for papers in college, he pursued primary sources and worked hard to collect every version of the story he could find. He interviewed his friends who had helped to look for him. He sifted through park service files, interviewed the rescuers and other people who had been a part of his experience, and even sought reports about the efforts made to recover his hand. He solicited transcript copies of the 9-1-1 calls his mom made, and then took on the difficult task of interviewing his mom for her version of what happened. “I found myself crying into my keyboard transcribing her interview,” Aron says. “Hearing how tormented she had been. It was torture for her.” Writing out the narrative of his mom’s account of the story was the most difficult part of writing his book. Aron continues to create his legacy. When he is not out living new stories, he speaks about his journey. He has run across many people who have found strength from his book. Readers have been inspired to change college majors, to move to Colorado, to make a career change, and a number of people have shared how Aron’s book has saved their lives. One man told Aron he read through the book six times one summer in order to move through a difficult period of depression. It is exactly the type of impact Aron had hoped his book would have. 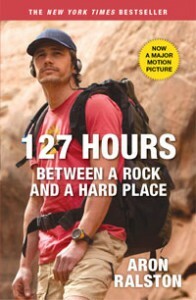 There will be more to write for Aron Ralston. He continues to hike, climb, ski, bike and live a life filled with adventure. He is living good stories all the time, and although he finds inspiration in the spaces outside, he recognizes the power of what happens when he comes inside to write it all down. 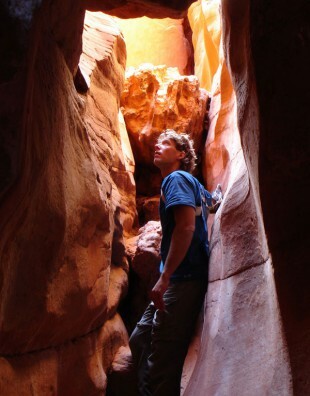 Feature photo: Courtesy Aron Ralston.